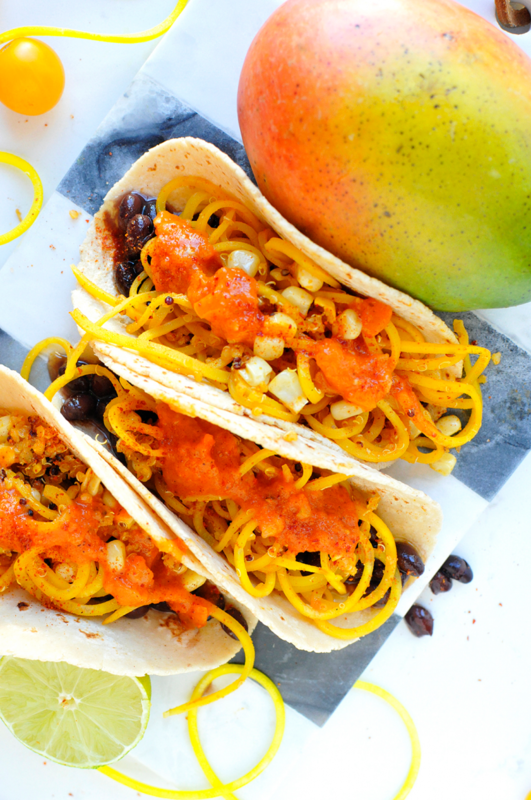 Gimme alllllllllllll the perfectly ripened mangoes, golden sunburst tomatoes, and tacos. And margaritas. The mango salsa is a blend of fresh mangoes, Silk unsweetened cashewmilk, lime juice, golden sunburst tomatoes, chile lime salt, and adobo pibil sauce. It's creamy and delish --- as a taco topper or by the chip-ful. 1. The key to a successful vegetarian meal at my house is making it hearty/filling enough for the meat-loving husband. That's where the quinoa (packed with fiber and plant-based protein) and black beans come in! They bulk up the meal just right, so that everyone is totally satisfied. 2. Use seasonal fruits and veggies. They're cheaper (because they're growing in abundance at that moment). They're at their peak flavor (so they taste better!). 3. Switch to a plant-based milk, like Silk's Unsweetened Cashewmilk. It's super versatile, uber creamy, and has 0g of sugar. 4. Be adventurous! Try lots of different things. Think beets in tacos (or in pancakes) are weird?! Fine. But, don't knock it 'til ya try it!! over 50 of the recipes in my upcoming cookbook: Superfood Weeknight Meals, which you can now preorder! This is a sponsored conversation written by me on behalf of Silk. The opinions, recipe, beautiful food photos, and text are all mine. 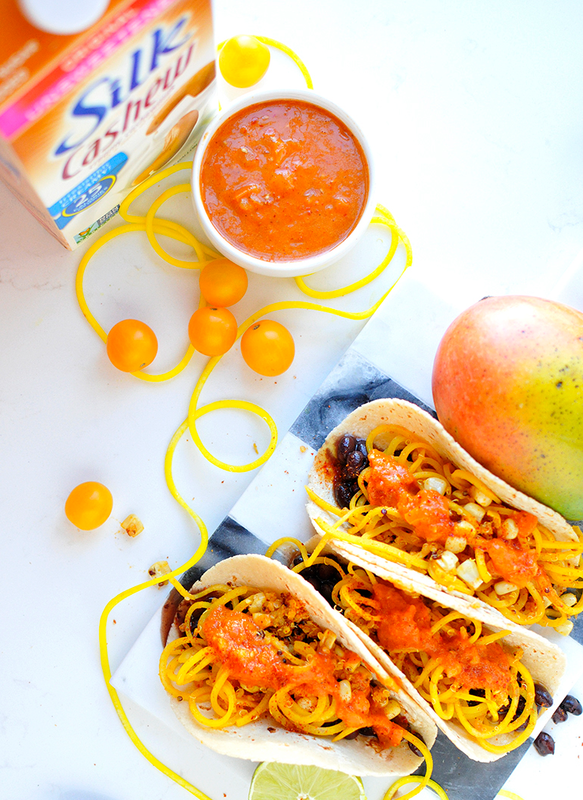 Golden Beet Noodle Tacos with Mango Salsa! *This is the adobo pibil sauce that I used in this recipe. 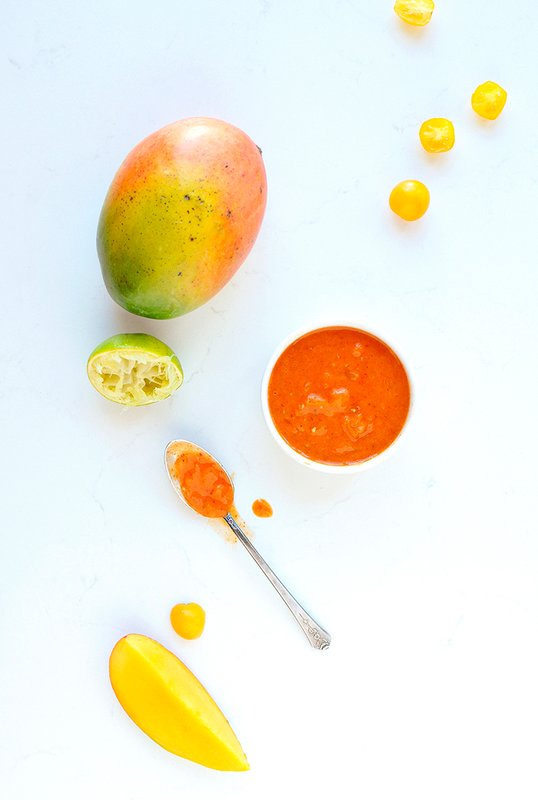 Combine the salsa ingredients in a high-speed blender, or an immerision blender will work: tomatoes, Cashewmilk, fresh mango, lime juice, mango, chile lime salt, and adobo sauce. Blend until mostly smooth. Then, set aside. Spiralize your beet into noodles. (this is the spiralizer I use/love). In a large skillet over medium high heat, combine the avocado oil, corn, quinoa, and beet noodles. Saute for approximately 8 minutes, stirring often. Sprinkle on the cumin and paprika. Heat up the black beans in a separate pan on the stove, or in the microwave. Assemble your tacos: Tortilla, black beans, then the beet/corn/quinoa mixture. Top with the mango salsa. Adorn with sliced avocado or plain Greek yogurt (optional).